Bread puddings are one of those things that we never knew how to make because it was simply that - Bread pudding? How do we make it? Home cook Asiya came to our rescue when she shared with us her little family recipe! Heralded as her family's "perennial favourites", Asiya shares that this recipe is so simple even her young daughter - who hardly helps out in kitchen - can make it on her own! We saw this as a challenge and made one of our own. Jokes aside - Asiya's bread pudding is an absolute joy to make and very fun! For those with a sweet tooth, this Bread Pudding is a must-have and must-try! It can be served hot or cold, but personally recommend serving it hot with a dollop of Vanilla ice-cream and you've got yourself a winner! 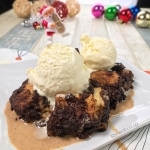 Here's the Bread Pudding recipe for you and your kids to have an enjoyable time! cFor those with a sweet tooth, this Bread Pudding is a must-have and must-try! It can be served hot or cold, but personally recommend serving it hot with a dollop of Vanilla ice-cream and you've got yourself a winner!